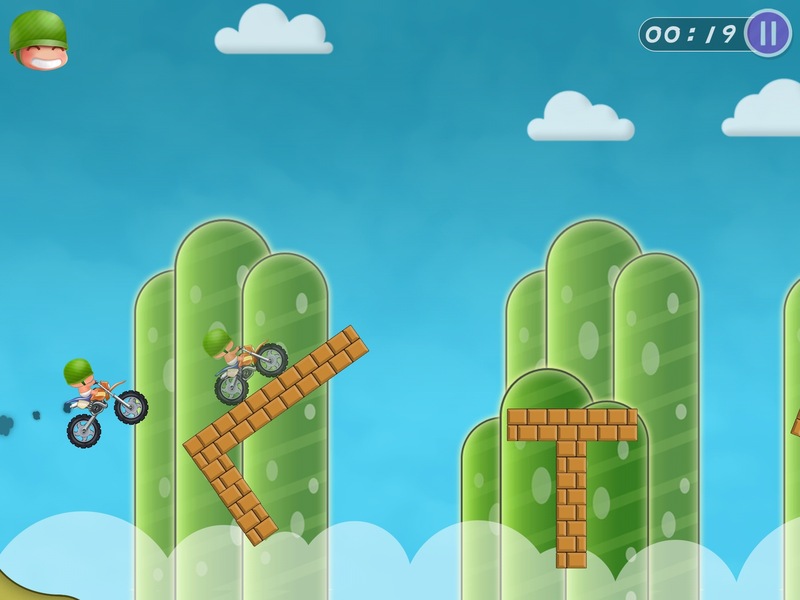 While there are plentiful dirt-bike games for your iPad, Hello Moto HD strikes the right balance of fun gameplay, easy controls, and accurate physics to make it worth a spot in your games folder. 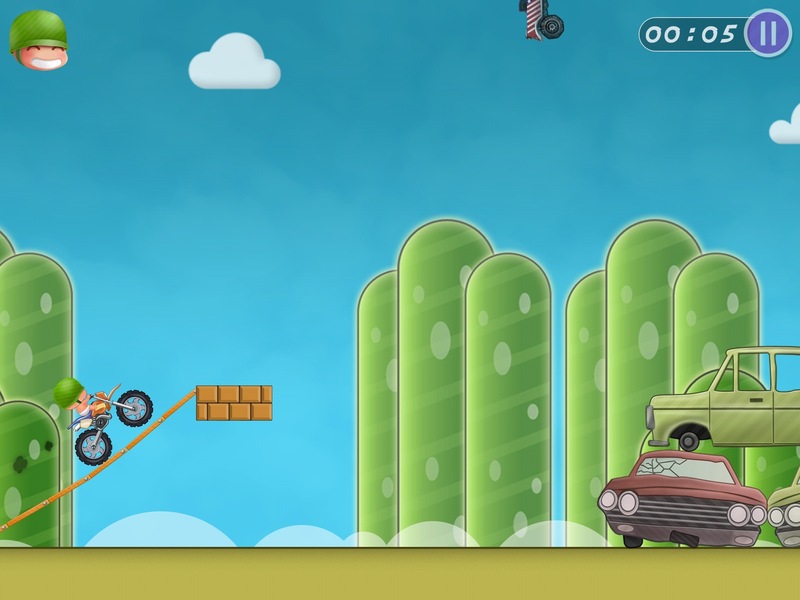 Hello Moto is a side-scrolling challenge in which you guide your dirt bike over 24 tracks (if you make it that far) with increasing levels of challenges. If games can be judged by frequency of play, then Hello Moto has earned an A+ in my casual-game world. In Moto HD you’re a dirt-bike rider that must guide his or her bike from left to right across a dirt track containing jumps, flips, and other tricks you have to master in order to reach the checkered flag. As you might expect, the tracks get harder and harder as you go along. 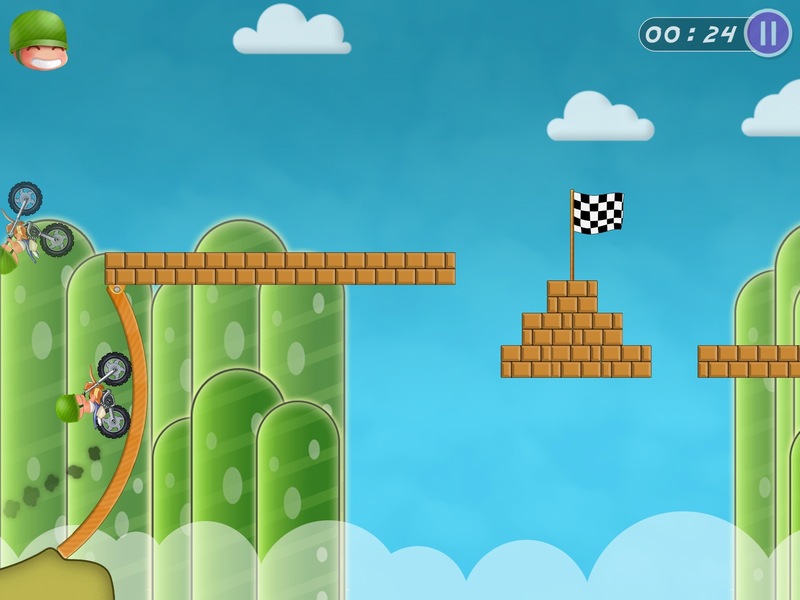 Each time you miss a jump, or fall into a chasm, or run into an obstacle, you crash and then start at the beginning of the track again. This process is less tedious than it sounds as you learn each trick fairly quickly as you go. 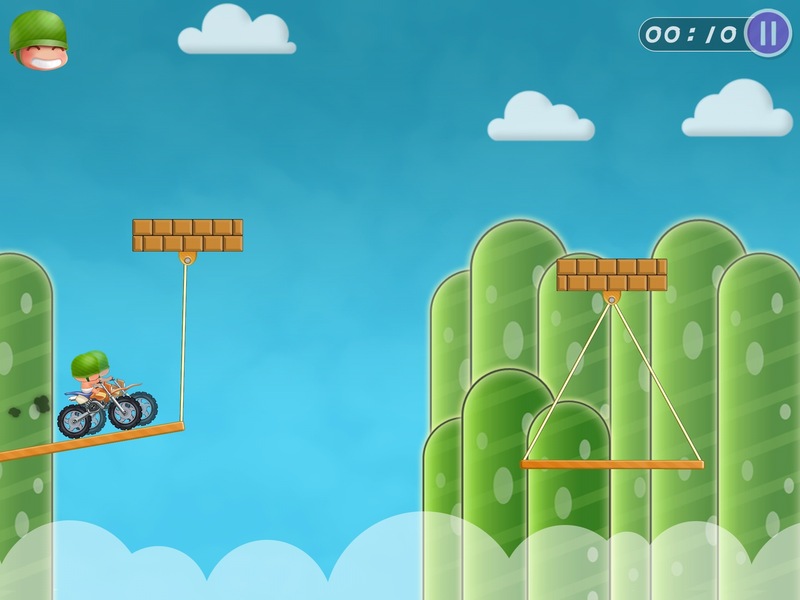 For example, you learn how to time your jumps to make it to the next platform, or how to make low jumps in order to not knock your block off on an overhead obstacle. Each track took me five–ten tries to master though of course your reflexes may be better than mine. The controls are as easy as can be: you press the bottom-right of the screen for gas forward, bottom-left for gas reverse, and tilt the iPad to control your attitude in the air (front wheel up or down). Whether you land on the front wheel, back wheel, or both wheels, combined with whether you hit with gas-on or gas-off all make a difference in how you’re set up for the next trick. And while some of the tricks are difficult, you never flub because of janky controls, which is the most frustrating way to fail at any iPad game. An innovation in Hello Moto is the chance to compete against a side-by side opponent, or even your own last performance. Hello Moto is free-to-play, but there are no advertisements, and the in-app purchases are unobtrusive. As you complete course, you collect stars with which you can buy upgraded bikes. In my experience I was able to upgrade and progress through the courses without spending a dime, although I wouldn’t mind contributing to a free game that’s this much fun. The graphics are simple and arcade-quality and so didn’t come close to challenging my original iPad Air; everything was smooth and crash-free. Here’s a link to Hello Moto in the app store. It’s free to play with in-app purchases. I'm an iPad, and iPhone enthusiast, Mac user since '84, world traveler, dog and cat lover, living in Kigali Rwanda for a year. Previous PostHow to upgrade or downgrade the iCloud storage on your iPadNext PostWhat are the best cloud storage options available on the iPad?